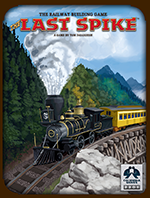 Read the Last Spike Rules now! 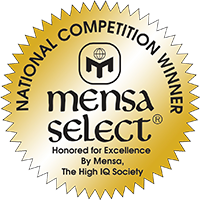 American Mensa has honored The Last Spike with a Mensa Select Award. 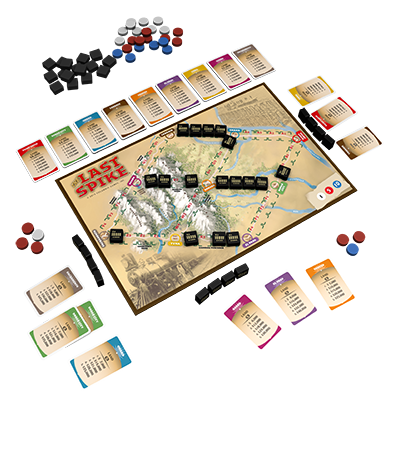 In the Last Spike, players cooperate to build a continuous railway from St. Louis to Sacramento. Different routes are possible and some towns never get a railway link. Each player also competes to accumulate the most money from land speculation before the "last spike" is played. The game is fast paced. You must act quickly to grab the best land, but you also need to give your competitors a helping hand now and then so the railway gets built where you want it to go. 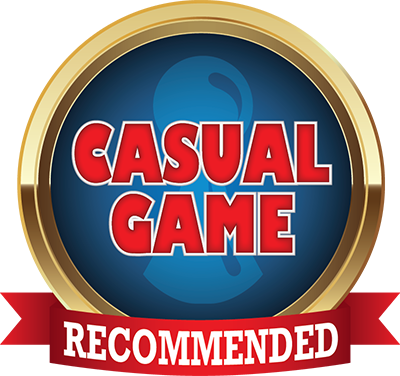 Quick to learn, the game is great fun for both kids and adults. The gameboard depicts the USA from St Louis west to Sacramento. Routes for the railway may include Omaha, Dodge City, Denver, El Paso, Laramie, Yuma, and Ogden. The eastern part is relatively flat, but there are some wide rivers to cross. West of Denver are the high Rockies where track building budgets soar. Your purchase is guaranteed: you may return the game for a refund if you are not satisfied.